Explanation: Fixed to a tripod and looking east across the Kennedy Space Center's Turn Basin, a camera captured these star trails as a series of short exposures over a three hour period on the evening of January 23rd. 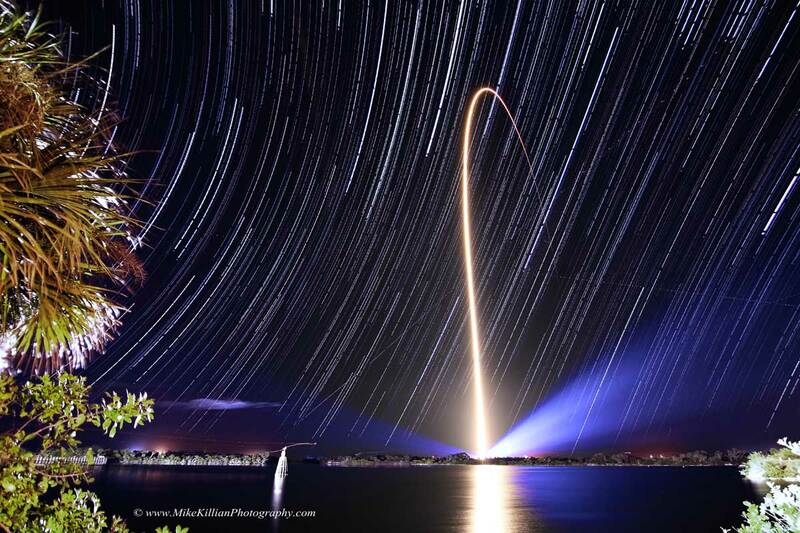 Positioned just a few miles from Space Launch Complex 41 at Cape Canaveral Air Force Station, it also captured a spectacular night launch of an Atlas V rocket carrying NASA's Tracking and Data Relay Satellite TDRS-L. Creating the trails, the apparent motion of the stars through the sky is just a reflection of the daily rotation of planet Earth on its axis. But that rotation is also the reason the rocket streak follows a path arcing east across the Atlantic. Launching toward the east, in the direction of Earth's rotation, adds the rotation velocity to the rocket and reduces the fuel needed to reach orbit. A little ironically, TDRS-L is destined for a geostationary orbit. From there, 36,000 kilometers or so above the equator, its orbital period will match Earth's rotation and the satellite will hang motionless in planet Earth's sky.